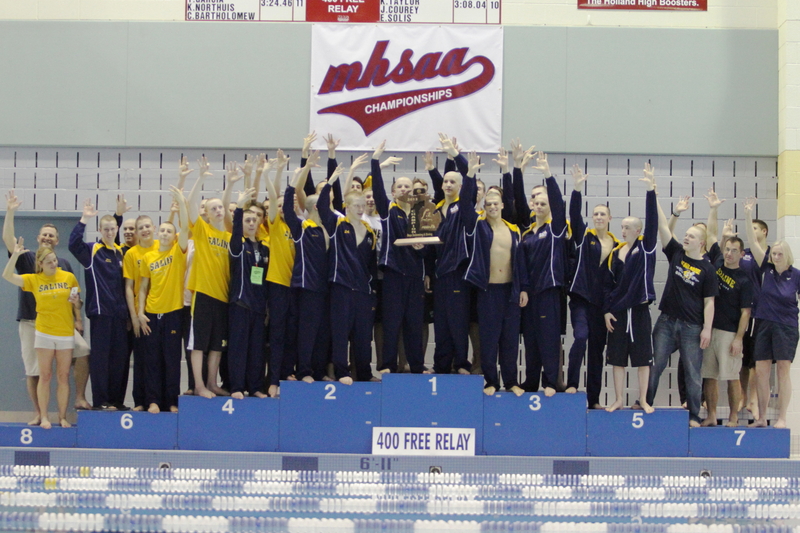 The Saline Boys Swim and Dive Team won its 4th straight MHSAA Div 1 State Championship on Saturday. The Hornets dominated the day, but had to truly battle to defeat Brother Rice. It came down to the last race and the Hornets finished strong enough to bring home the title. This senior group has set a new standard for swim teams in the state that may never be matched. The Hornets hold the D-1 record in the 200 free relay. The Hornets hold the all class record in the 200IM and the 100 breast. The Hornets hold the D-1 record in the 100 back and 100 fly to go along with the four other records. The Hornets hold SIX Division-1 records out of 11swimming events. This state championship meet alone generated another -21 All American Awards. Saline won 9 events this year. Out of 12 events, 1 which was diving. Including setting the National Record in the the 200 Medley Relay at a pace of 1:30.01. In the past four years, there have been 48 events. Saline has won 27 of the 48. It was a true team effort as our divers came up big for many needed points. All three divers moved up from Friday’s positions and Saline’s Dive Coach, Gretchen Palmondon was named Dive Coach of the Year. Saline Senior, Josh Erhman was named Swimmer of the Year. It was a great day for a incredible team. Congratulations to all of our Hornets and Coaches. FYI one change saline holds D1 record in 200 free relay, not all class. We hold all class in 200 medley relay. Thanks – I made the edit. Congratulations to the swim team, 4 in a row, that’s awesome!